As part of a university movement against right-wing thugs on campus, thousands of Mexican students marched in silence to commemorate the Silent Demonstration of 1968. 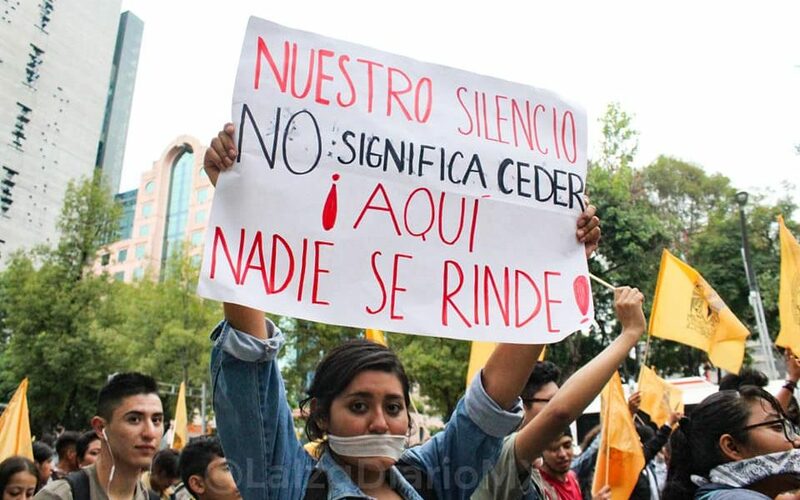 Sign reads: My silence does not mean giving up. Here, no one surrenders. On September 13, 1968, thousands of students took to the streets protesting the government’s violent repression. President Gustavo Díaz Ordaz Bolaños had repressed previous demonstrations against police brutality and had called in the riot corps and the army. This protest went down in history for its exceptional silence. The Silent Demonstration, as it was called, was an idea born from student leader Marcelino Perelló Vals, son of Catalan anarchist Marcelino Perelló Domingo. Perelló Vals took his inspiration from a silent demonstration in Catalonia four years earlier against Franco’s regime. 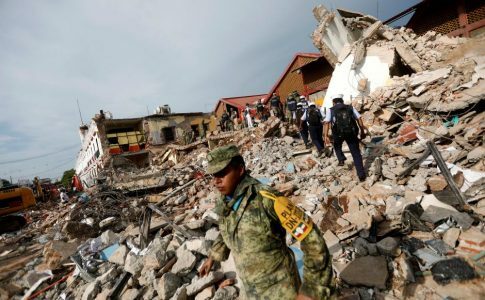 Mexico’s Silent Demonstration would stress that the movement was nonviolent. An estimated 40,000 people marched in 1968 from the National Anthropology and History Museum in the Chapultepec forest to the Zócalo, Mexico’s public square. Most of them were students, but many workers also participated. Fifty years later, Mexico’s students have launched a new movement against “porros,” or university- and government-funded thugs who intimidate and beat up left-wing activists. After the porros beat up several students, hospitalizing several, there was a massive strike a few weeks ago in Mexico’s largest university, the UNAM. Mobilizations have not ended since. At the UNAM, massive assemblies are planning new actions and demonstrations. The anti-porro movement chose to commemorate the Silent Demonstration by reenacting it last week. 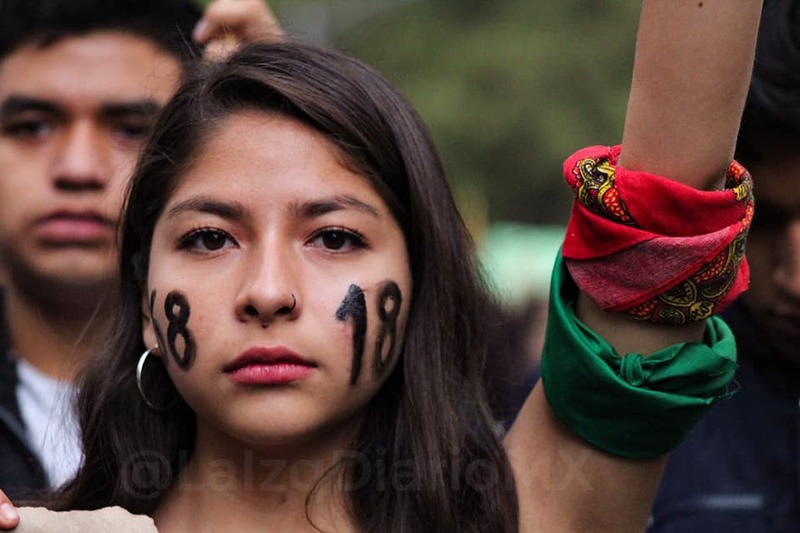 Student has 68 and 18 written on her face, commemorating the student mobilizations of 1968. Just as in the original, demonstrators met at the Anthropology Museum and marched to the Zócalo. Students from the UNAM, the Polytechnic, the National Fine Arts School (ENBA) and the National Anthropology and History School (ENAH) gathered in front of the Museum’s Chalchiuhtlicue monolith, despite the rain. 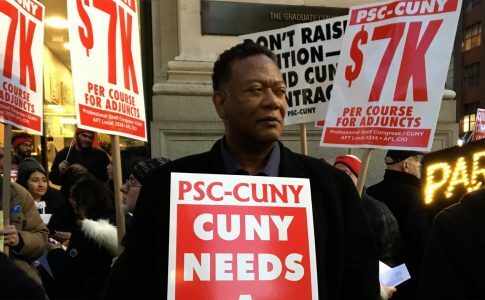 They poured in by the thousands from the nearby subway stations, coming directly from their schools, many of which were still on strike. Starting from the Stele of Light, a 340-foot monument to commemorate the 200th anniversary of Mexico’s independence, the demonstration marched in silence until it reached the “anti-monument”: a giant red “43” erected in memory of the 43 Ayotzinapa students and all of Mexico’s disappeared. These students were disappeared by the government in 2014, sparking massive national and international protests. This means that for almost two miles, students marched in absolute silence to demand that porros and all porro-like groups disappear from UNAM. 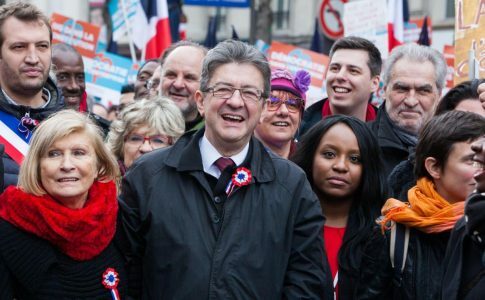 Many also demanded free, quality public education and the end of police and government repression. Sign read: Before they forget us, we will make history. September 18th marked the 50th anniversary of the military occupation of the UNAM’s University City amidst massive student and leftist organizing. 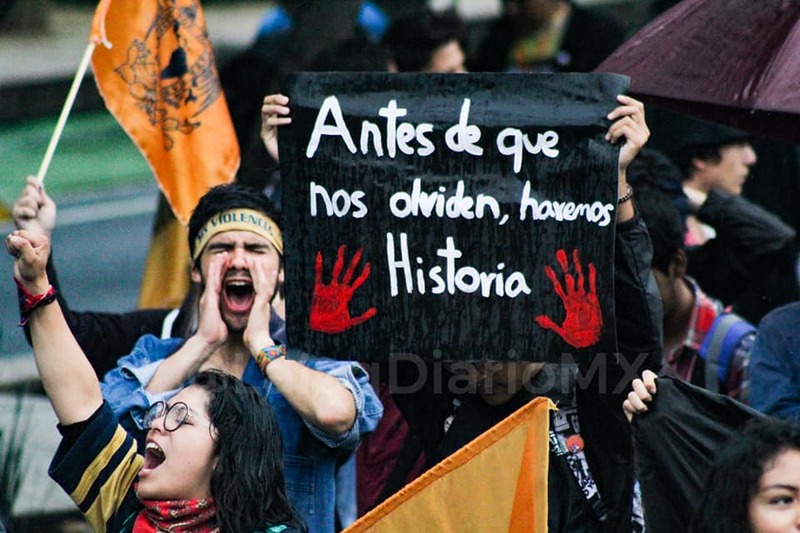 Starting the 18th, UNAM students will engage in a “week of struggle” (jornada de lucha) that will culminate with the yearly October 2 demonstration in memory of all students killed and repressed by the Mexican state. Fifty years ago, porros were a key element in the repression of the left.